The Whisky 16 ROCKER shown here in red. FOR THE EXPERIENCED PADDLER the Whisky 16 Rocker is perfect for getting in and out from between rocky outcrops, surfing on tidal races and maneuvering. It is personal model of choice of Roto-molded Polyethylene (PE) for Nigel Foster. With its fuller bow and stern shape to reduce plunging, the Whisky 16 is designed to make the most of rough water, surf, and currents. It is perfect for day trips but spacious enough for a self- contained expedition paddling. THE WHISKY 16 ROCKER has a more distinctive Rocker compared to the Whisky 16 Tourer: that is it has a more distinctive banana shape. The Rocker makes it more maneuverable and nimble. Just what you need for riding wind waves, control surfing, playing in rock gardens along the coast and for the most fun in current. The Tourer on the other hand with less rocker offers better tracking and marginally more speed. 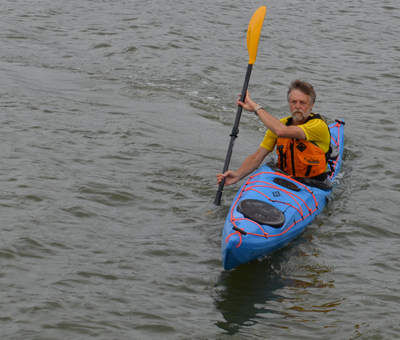 For buying availability in USA, check the Nigel Kayak Store.